A recent study commissioned by the Seattle City Council showed that only 6 percent of all workers on Seattle City-funded construction projects were Seattle residents, while a whopping 70 percent commuted from outside King County to city job sites. Green’s South Seattle Jobs Committee has been organizing for three years to turn public construction dollars into living wage, local jobs and apprenticeship training for people of color, single moms, and unemployed workers. 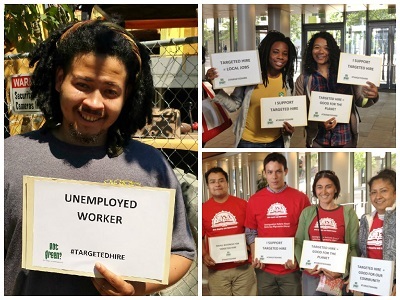 When the Seattle City Council passed a unanimous resolution last September to investigate targeted hiring strategies to provide good jobs to marginalized workers, Got Green celebrated. Almost a year later, the rubber meets the road. Will Mayor Murray and the City Council take the lead from communities of color, small businesses and building trades unions and get behind a strong city ordinance requiring targeted hiring of workers from low-income communities of color on publicly funded job sites? Our City cannot bend to pressure from big business contractors who reap the benefits of our local tax dollars while importing a workforce from outside our region. Passing a Targeted Hiring Ordinance before City Council enters into the annual budget process is a top priority for Got Green and the 40 partner organizations in the Targeted Local Hiring Coalition. To meet this goal Council will need to introduce the ordinance on August 7th.